Always the professional stallion, Tapit walks and poses for prospective breeders and others during his daily two-hour show time. And the gray (now almost white) always looks spotless as he is paraded by the stallion barns and breeding shed. 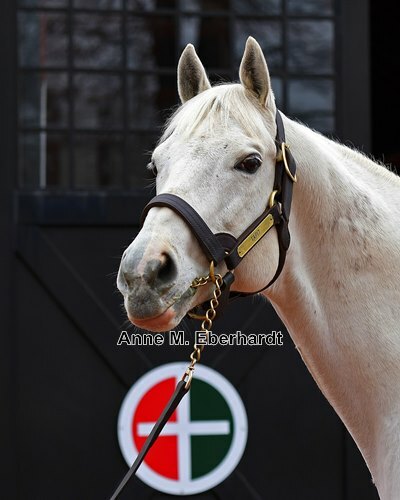 And then there are the other 22 hours in the life of Tapit, when insights into the 16-year-old's character come out. Somewhat set in his ways, Tapit has his preferences. His day starts at 7 am when he goes out to his paddock. 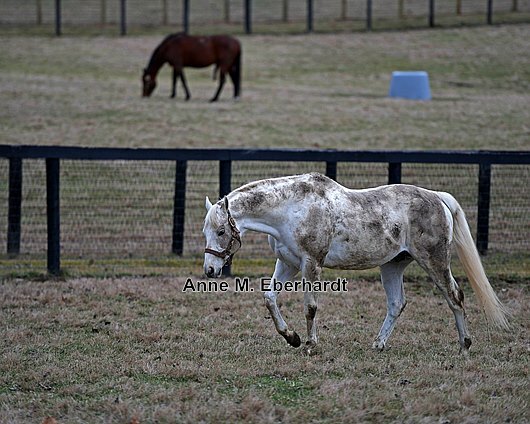 His routine almost immediately upon going into his paddock includes a roll (or two) in his mud patch. "He loves to roll," said groom Pedro Venegas. Late morning, the influential sire comes out of his paddock when some grain is offered, and goes back to his stall where he is prepped for his afternoon viewings. 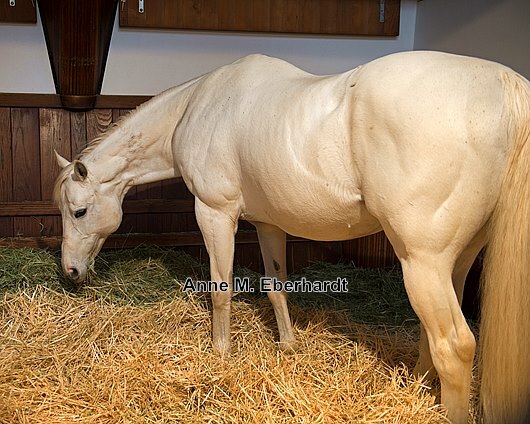 Tapit shares a stallion barn with his son Tapizar. 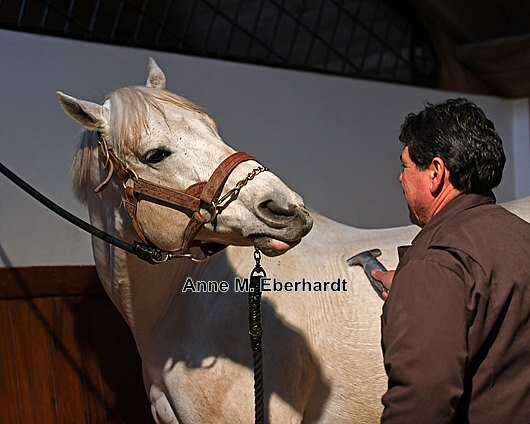 On cold wet days, Venegas lets Tapit dry and then uses a vacuum to clean off all the mud on the stallion. Then he gets groomed, his mane and tail combed, his body brushed. 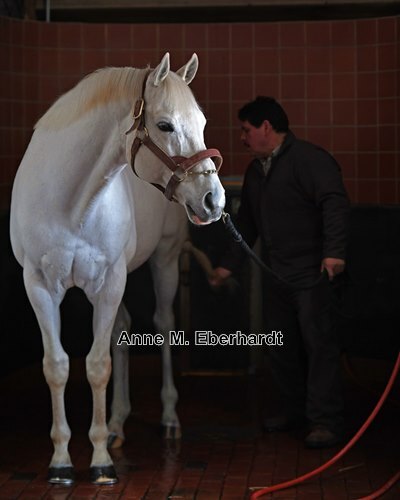 Like a massage, Tapit seems to feel good and enjoy the attention. He often interacts with Venegas while getting groomed in his stall heaped with straw. 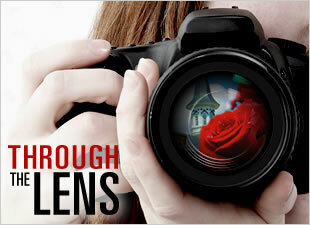 "He knows he is the main guy," said Venegas. Next, the stallion's temperature is taken. Then Tapit is left in his stall to enjoy his hay, and then after feeding he gets quiet, dozing off and on, before show time. The off-season allows for more leisure time. 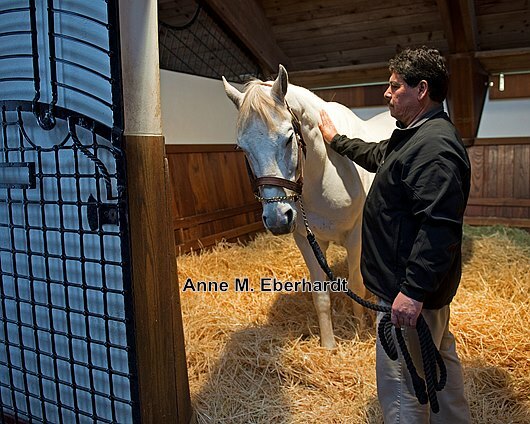 Breeding season now has started and Tapit has returned to the breeding shed, starting at 9 am daily with three scheduled breeding sessions per day. 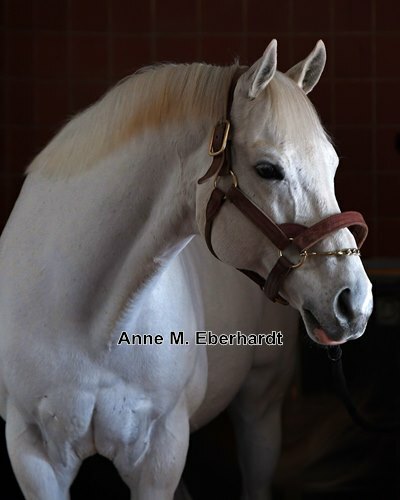 For more Tapit photos and a feature by Cynthia Grisolia see the spring issue of Keeneland Magazine, available late March on newsstands. Special thanks to Gainesway Farm, Ian Tapp, Pedro Venegas, and Carl Buckler for the opportunity to chronicle Tapit's daily routine. 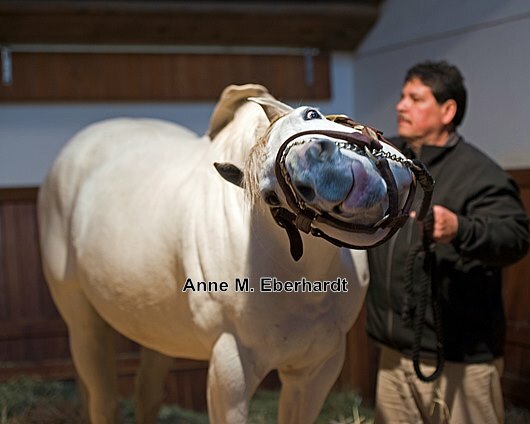 For more photos and features on Tapit visit the BloodHorse Photo Store and BloodHorse.com.